The unique styling is very pleaasing to the eye. The Lexmark has an impressive 1,200x1,200dpi print resolution, USB 2.0 and Ethernet connectivity. A 250- sheet internal paper tray and 128MB of RAM are also part of the base specification. The Lexmark is tall but not back- breakingly heavy. It's clearly well put together and feels solid. The LCD panel is clear and the internal menu easy to navigate. Each of the buttons respond well when called to action, adding to the overall sense of build quality. The sit-up-and-beg styling is also quite pleasing. This Lexmark is lightning-fast for a budget printer, spewing pages out at a prodigious rate. Ten pages of text take just 36 seconds and full-page colour documents only seven seconds to find their way to the output tray. The speed does nothing to inhibit the quality of the documents, as the Lexmark produces very high quality text and images. Characters are sharp and clear at all sizes and there are no fuzzy edges to any of the text. Colour is spot-on with images retaining a lifelike and neutral tone. Detail is also excellent and this printer's results stand head and shoulders above the competition for all-round quality. The Lexmark has nearly everything going for it; with fast output and high quality prints the C522n is a very capable machine. The price is a little high for a budget machine, but the performance more than makes up for this. It's hard to fault this machine which exceeds our expectations performance wise. 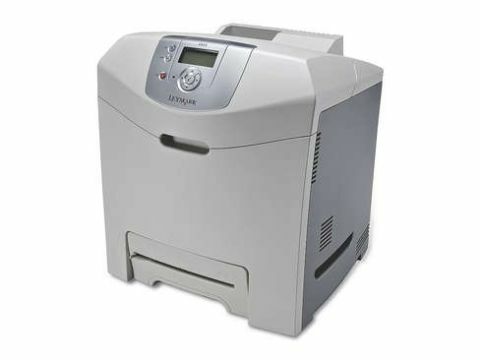 The C522n combines build quality, good looks and flawless operation into one unit.